La Harpe: The Committee of Ten public meeting for a school reorganization among Carthage, Dallas City, and La Harpe school districts met last Wednesday in the La Harpe gymnasium. Chair Tracey Anders opened the meeting telling those who gathered that the Committee of Ten is seeking convergence to maintain local control of their Elementary and Junior High schools while at the same time consolidating three high schools to bring course offerings to an acceptable standard for college bound students. The estimated enrollment for a consolidated high school next fall is 500 students which is recommended to be temporarily housed at the Carthage high school under a lease agreement with the Carthage elementary district. The committee proposes four classroom units and some adjustments to the proposed curriculum. The decision as to when to submit a bond referendum will be up to the newly formed board of the newly formed high school district, but committee members said, the Carthage site is not big enough to adequately house all that is needed for a combined high school. Although the combined enrollment will create the capacity to provide a new modern high school building, they are not proposing a building bond at this time. The three districts remain on the list for the School Construction Grant Program with a grant index, as it stands now of 60% of the cost leaving 40% for the new high school district to cover. The earliest ballot date for voter decision on a bond referendum would be April of 2008, according to a hand-out given out that evening. Walt Swearingen, Carthage Committee of Ten member, said, "I can't tell you how pleased I am to have our students given the opportunity to attend a school with better curriculum. It means so much. Swearingen said they were fortunate to have two Guidance Counselors on the committee to plan the suggested curriculum. There will be more advanced courses without students traveling out of the District or without choosing between two. "Our goal is to have them graduate with more background and understanding in their chosen area," he said. Pat Deitrich, Committee of Ten Secretary pointed out the increased difficulty she has seen La Harpe students have in planning for college. "I have watched board members make difficult decisions because of lack of funds. It is hard on students, teachers, and board members." Deitrich said it has been tough for them to meet operating expenses. It has been very difficult and we have the opportunity to make a difference. "We won't have an opportunity to vote on it again for two years," she said. Some want a county school, but a seven district consolidation would be very difficult to pass, she said. It was also discussed the declining enrollment which is expected to be down by 25% by 2013 which would put the elementary at 255 students. There will be shuttles available for transportation back and forth to the high school at Carthage. At the Elementary, it is planned to use the high school facility and the Johnson building, and the old band room and put an addition on the west side of the building to house a cafeteria and class rooms. There is a bill in the Senate they are hoping will pass that will help allow a 72% state grant leaving only 28% for the district to pay if it passes. Barb Cox, Committee of Ten treasurer reminded those in attendance that taxes were going to go up whether it passed or not, due to shortage of funds in operation expenses in the La Harpe District. This is an opportunity to actually be getting something for your tax dollars. Rich Johnson, from the La Harpe School board, put his full support in the convergence and for the work done by The Committee of Ten. "Our kids will lose if we keep this erosion up." "How long will this last?' one man asked. Tracey Anders said they had put together the worst scenario and they knew it would be workable for five years. There were more details discussed by the Committee, the community and Superintendent Joe Campbell that was very informative. It is recommended attending one of the following meetings so you can be informed properly for this very important election. Before the March 21st election, there are three more public meetings set for 7:00 p.m. each night. Thursday, March 9th at the Carthage Baptist Church meeting room. 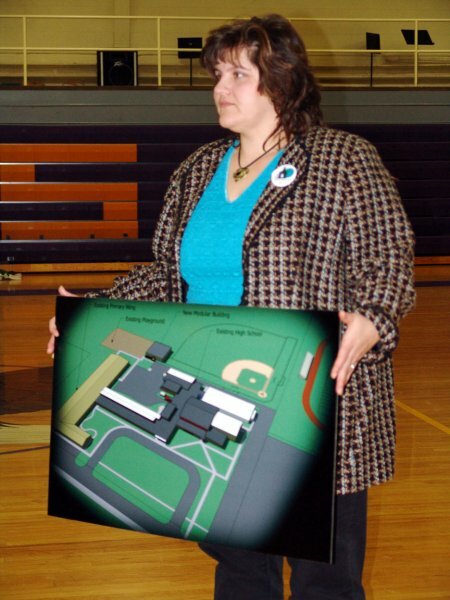 Cindy Logan of Lomax shows the plan for the addition of school rooms at the new proposed consolidated high school in Carthage this fall.